Dracula author Bram Stoker was born on the 8th of November 168 years ago. I love remembering the birthday of a man who achieved symbolic immortality by creating an unforgettable immortal being – Count Dracula. I wanted to create a recipe in his honour. Normally I would go for something more gothic, but I found myself wanting to pay tribute to his Irish heritage. I thought Irish Stew or Irish Soda Bread (or both!) would be great but it’s nearly summer here so hot stews and breads are a bit heavy. Maybe I will make them for his Deathiversary in April – hopefully it will cool down by then. Thinking of the long, hot days ahead made me think of drinks and as a big coffee fan I thought of Irish Coffee. 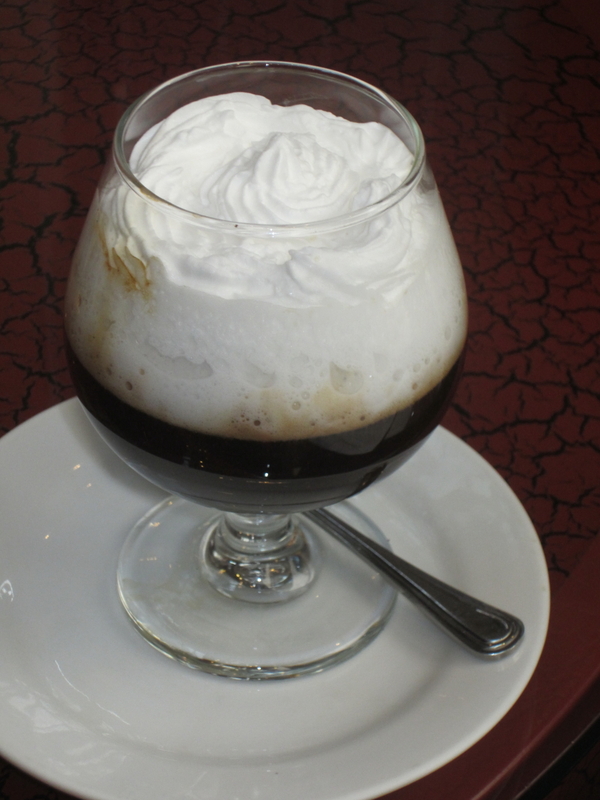 Early versions of Irish Coffee were simply hot black coffee with Irish whiskey and brown sugar stirred through, topped with thick cream. Later versions added a slug of Irish cream liqueur – yum! Naturally I wanted to add a twist. 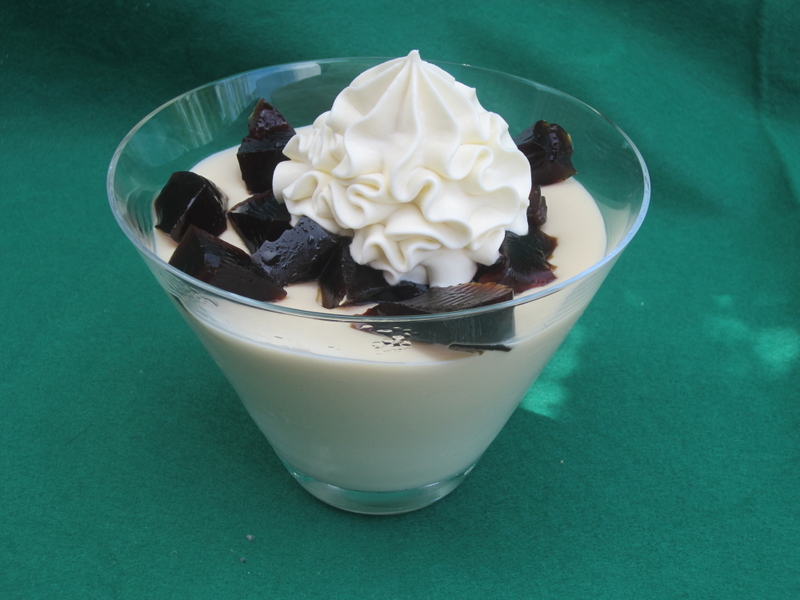 I played around with a dessert version of the classic drink and decided to make an Irish cream liqueur panna cotta, dotted with cubes of coffee jelly and topped with a whiskey cream. Working with gelatine is an adventure in itself. I use the leaves as sometimes the powder is difficult to combine and can become grainy. Leaves are great but they come in different strengths and you’re not always sure what strength they are. For jelly I usually follow the recommendations on the packet for the water/gelatine ratios. For panna cotta, I often use a bit less gelatine as I sometimes like my panna cotta creamier and less set. The panna cotta below is soft set so it contrasts well with the jelly. If you like your panna cotta set more firmly, just use more gelatine. As this recipe is assembled on serving, you can add as much or as little coffee jelly and whiskey cream as you like. You can also choose whether you want the panna cottas to serve two, four or more people. Soak the gelatine leaves in cold water for 10 minutes to soften. While gelatine is soaking heat the cream and sugar together in a saucepan over medium-low heat. Bring to a simmer then remove from the heat. Squeeze the gelatine leaves to remove any excess water then add them to the cream mixture. Whisk until the gelatine has dissolved. Stir in the Irish cream. Pour panna cotta into a heatproof jug. Allow to cool to room temperature, stirring regularly with a whisk. Give a final stir then pour evenly into glasses or bowls. Leave some room on the top for the jelly and cream. While gelatine is soaking heat the coffee and sugar together in a saucepan over medium-low heat until warm and the sugar has dissolved. Remove from the heat. Squeeze out any extra water from the gelatine leaves then add to the warm coffee. Whisk until the gelatine has dissolved. Pour jelly into a square or rectangle container. Allow to cool before covering and refrigerating until set. Cut into rough squares for serving. Using a wire whisk, beat together the cream and sugar until soft peaks form. Whisk in the whiskey until combined. Cover and refrigerate until cold. To serve, dot the panna cottas with coffee jelly cubes and pipe or dollop on the whiskey cream. Beautiful. Delicious looking. I’m off to raid the fridge. It would certainly wake you up! I can’t believe some of the amazing recipes you have made, this one definitely takes the dessert. Many thanks once again.